RTU curb for metal roof features factory welded rib pockets to match roof, welded water diverter and perimeter insulation. 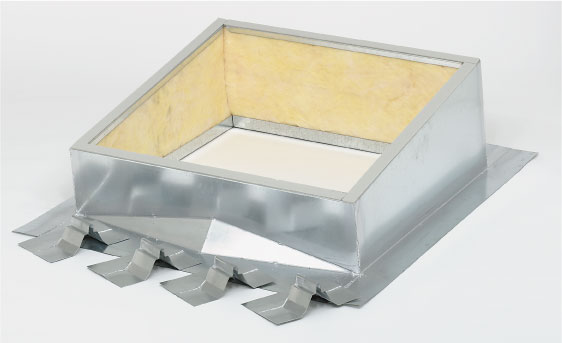 Duct hangers or full-height cross members or insulated panels fabricated as needed to match RTU manufacturer's factory curb. 14 ga. galvanized or 18 ga. galvalume steel. Meets requirement of MBCI specification (and MBCI related companies). For installation only under the peak side (or uphill) roof sheet and over the eave side (or downhill) roof sheet. Constructed of .080 aluminum with integral side rib and weather batten to cover side seam and factory welded rib pockets.